Records of this digital collection were assembled to document the work of the UN Special Committee on the Problem of Hungary established on January 10, 1957 by the United Nations General Assembly for the purpose of investigating the 1956 Hungarian revolution. Information regarding arrival and departure of refugees in Austria and other countries on January 4, 1957. 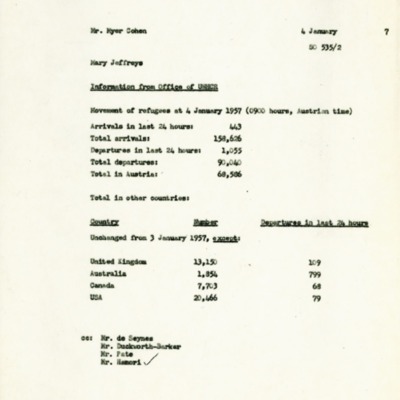 Héderváry, Claire de, “Information from Office of UNHCR: Movement of Refugees,” <1956> Digitális gyűjtemény, accessed 2019. április 25., http://1956.osaarchivum.org/document/64ac5b7e-3398-4e92-bdc0-09e8f9f49624.